HOWZAT - SolidWorks Simulation Bowling us over! HOWZAT – SolidWorks Simulation Bowling us over! Our nation (England) will soon be in mourning when the Australian cricket team claw back those coveted Ashes. How can our acclaimed 11 be blown away with such ease by the Aussie bowlers? It is tempting to be critical when you see the ultra-slow-mo of the ball making a mess of the stumps or that little nick to the slips, but consider, for a moment, the speed of events. Mitchell Johnson is hurling the leather at 95 mph. A simple calc tells me that the ball travels the 22 yards from bowler’s hand to the batsman in about 0.5 secs – that isn’t much time to adjust your body and move the bat to ball. I wondered what that would look like and decided to knock up a quick Motion study in SolidWorks. Since Motion uses real-world physics to calculate the movements, it is an accurate simulation of what really happens. I added an initial velocity to the ball of 95 mph at 2 degrees from the horizontal and at about the correct height. I added ‘Contacts’ between the ball, pitch and stumps and after a little adjustment knocked the stumps over. I also took advantage of the new 2014 Sunlight option and picked December in Australia to get realistic lighting and the right shadow length and orientation for 4.00 pm in the afternoon. Here is what it looks like in ‘real’ time. (Note this might play more slowly than in real life if you have a slow internet connection). Not so easy is it? For those of you who blinked, here is a replay at 1/10 speed. bowler’s hand (due to gravity) and then takes a sudden change at 0.4 secs when it hits the ground – friction causes it to slow up a little. 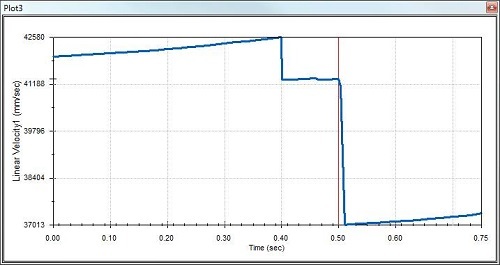 It then takes another change at 0.5 secs when it hits the stumps before continuing at about 37 m/s. 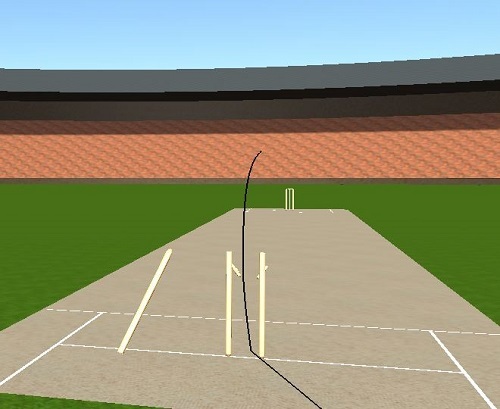 Motion remains one of the best kept secrets in SolidWorks and is invaluable engineering tool, even if it simply proves how good the Aussie bowlers are!